Enjoy your vacation at our peaceful home on the Big Thompson River, just a short walk from Rocky Mountain National Park. You'll have access to 12 acres of shared wooded grounds, a playground and picnic area, plus a quarter-mile of private river frontage! Our home is light, bright, and spacious, with vaulted ceilings and lots of windows to enjoy the views. The Wind River cabin is fifty yards from the river and offers mountain views as well. On the main level you'll find a fully equipped kitchen, dining area, and a comfortable living room where you can watch cable TV or build a fire in the moss rock fireplace. This level has BEDROOM 1, with a king bed and adjoining full bathroom. Upstairs are Bedrooms 2 and 3, both with vaulted ceilings for a spacious feel. Both bedrooms have doors to a connecting bathroom with double sinks and an oversized walk-in shower. BEDROOM 2 has a queen bed and views of Eagle Cliff Mountain. BEDROOM 3 is quite large and decorated with a bear theme. It can sleep up to four in one queen bed, one twin bed, and a twin-size trundle that pulls out from under the twin bed. The trundle can sleep an adult, or it's a great option for young children not quite ready for a 'big bed.' This room has its own TV with DVD player. We also have a booster high chair and pack-and-play available for your use. What's a day like at the Wind River cabin? Start with morning coffee on the deck as you watch the hummingbirds. Then put on your hiking shoes and walk along the river and into Rocky Mountain National Park. A short walk takes you to Moraine Park, one of the prime wildlife viewing areas in the national park. In summer, you can avoid traffic altogether by walking directly into the park. If you fish, you'll enjoy the quarter-mile of private river frontage just steps away. (We don't provide equipment, but we can point you to the right place in town.) Cook up your trout on the grill and dine outside at the picnic table on the deck. Our kitchen has bakeware, pots and pans, and a full complement of utensils. When you don't feel like cooking, you can walk across the street to the Dunraven Inn, a family-friendly Italian restaurant. Or, downtown Estes Park is only 2.5 miles away. Stay at least a week if you can – you'll find lots to do. Thanks for visiting us. We look forward to hearing from you! We affectionately call our home the 'Wind River Cabin,' but it is a fully modern house built in 1998. It is one of about 25 houses in a small, covenant-protected community spread across 12 private acres. As our guest you have full access to the shared grounds, including the large picnic area and playground by the river. We do have neighboring homes on either side, about 30 feet away, but NO homes in front of or behind our house. We have incredible views! 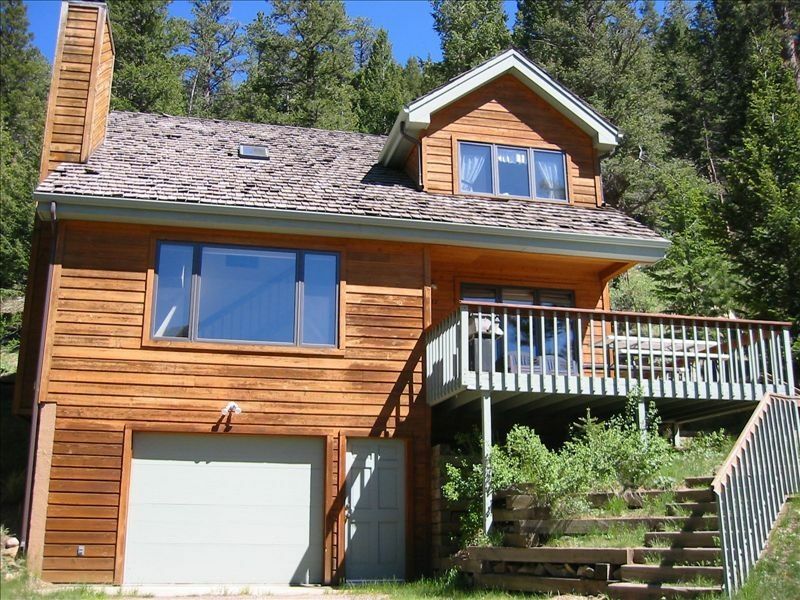 Our home sits up above the Big Thompson River, and your view down to the river is unobstructed except for a few beautiful Ponderosa pine trees. You can see and hear the river from almost every window in the house, and it is a very short walk to the water. You can fish on the property (state fishing license required for ages 16+). Our community is a mix of vacation rentals, second homes, and full-time residences. The location is private and quiet yet only a 5-minute drive to town. Our deck has an outdoor grill. There is NO HOT TUB. This is not just a rental property, it's our second home, and because we live nearby we can ensure that our home is always in top condition for our guests. After a long search we found the perfect blend of wilderness and convenience, adventure and amenities. We enjoy sharing with our guests what we love about this special place. We can walk out our front door and sit by the water, or stroll up the river to watch elk and other wildlife - no car needed! Nearby trails take us to some of the wildest and most scenic areas in the country, yet we can walk to a restaurant or drive to town in less than 5 minutes. We love sitting on the deck and looking down to the river and up to great views of Colorado's snow-capped peaks! Our house sits slightly above the river on the banks, but is not directly on the water. There are no houses between us and the river, just a few trees as you look down to the water. All was in order and we had an enjoyable time. We came up for our first family vacation with our grand kids and our son and his new wife. We all had plenty of room. It was comfortable and we'll stocked. We played games, had Thanksgiving dinner and we're able to seat all 7 at the table. We had a wonderful stay! This house has it all! Wonderful location - we could literally walk into RMNP. The house was very clean, and attractively furnished, and this was the best-stocked house of any we have rented - generous supplies of paper needs, cleaning supplies, and kitchen staples. What made this choice particularly attractive to us was the crib and high chair, and a nice little playground next to the river. Communication was good, and the check-in and check-out quick and easy. An excellent choice, especially if you have young children. We stayed at this beautiful cabin for a week in September. Everything was perfect! Such a beautiful setting in the mountains and close to Thompson River. The cabin was very comfortable and had everything we needed. It was very clean and the kitchen was stocked with many items we used. We were 100% happy and satisfied with our stay here! loved waking up to the beautiful view every morning. Meredith was great to work with! We really enjoyed the cabin and definitely would stay there again! Walk directly into Rocky Mountain National Park through the original entrance along the Big Thompson River. Access the shuttle bus on foot and avoid traffic! Please note our 8-PERSON MAXIMUM, including children of all ages and at all times. Exceeding occupancy limits jeopardizes our rental license. Please do not plan to have more than 8 persons total at any time day or night. We never charge a cleaning fee. We do charge a $55 administrative fee per stay to cover extra costs for online booking. Use the Ask Owner A Question link to the right if you would like to pay without using a credit card. Check-in 3 pm & check-out 10 am. CANCELLATION POLICY If guest cancels …	/ Guest is refunded … More than 8 weeks before arrival / 100% less $55 admin fee Between 8 and 2 weeks before arrival / 50% of total is refunded. 50% of total is forfeited. Less than 2 weeks before arrival / Full rental amount forfeited. Damage deposit refunded. We will refund rent for any cancelled nights that we are able to rent at the same rate, up to the full rental amount less a $55 admin fee. Any refund of the VRBO Service Fee is per the policies of VRBO and not the Owner.